I loved this necklace when I saw it, and was given it as a gift. 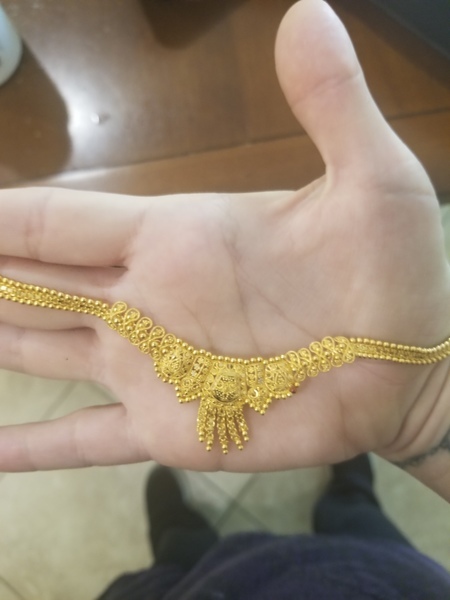 Unfortunately, I never wear it because it is so intricate, and the color of the 22k gold doesn't look great on my skin, IMHO. I want someone else to get joy out of it and actually wear it! It's been in my jewelry box for 3+ years now, only being worn like once or twice. I just went to a store to have it weighed, and it came out as 19.2 grams. Calculated gold prices (http://goldpricez.com/calculator/gold-rates) and it says $748 to scrap it, but I'd rather have someone enjoy it since it's so beautiful! I'd like to get $800 for this. NOTE: there is some discoloration on one of the "Balls" on the bottom. I took pics to show it, and also show the details a bit better. Also took a pic showing the 22k stamp.